Thinking of a trip to South Florida? While you'll certainly enjoy your time and have plenty of fun in the sun, you will need to put some work into planning your trip. What's the weather like? What type of clothes should you bring? What are musts to bring to the beach? All of these are questions that we'll answer in this quick guide so you can make the most of your SoFlo experience. Palm Beach, Broward, and Dade Counties don't see too much variance in weather throughout the year. In a nutshell, it's hot and humid during the summer and mild in the winter. The summers are in the 80s and 90s F, and the winters have highs around 65 to 75 F. August is the hottest month, and January is the coldest. The rainy season in SoFlo is from May to September, and the least rain falls in December through February. Each year, South Florida gets around 60 inches of rain, with October being the wettest month. You can't discuss South Fla. weather without discussing hurricanes. Heck, the local university's mascot is the Hurricanes! When is hurricane season? From June 1 to November 30, with September seeing the most action. In terms of weather, when is it best to visit South Fl.? Spring is ideal since it's the sunniest and less humid than the summer. This allows for easy beach trips without soaking yourself in sweat every time you walk outside. There are also fewer crowds in spring when compared to winter. Fall is good as well, although it is wetter than the spring. Winter weather is excellent, but, as mentioned, you'll have to fight off crowds of visitors and people who call South Florida their second home. What you should pack for your trip to South Florida depends on your itinerary. Are you planning to hit fancy restaurants in Boca Raton's Mizner Park? Are you just going to get wet and tan at the beach and pool near Las Olas in Fort Lauderdale? 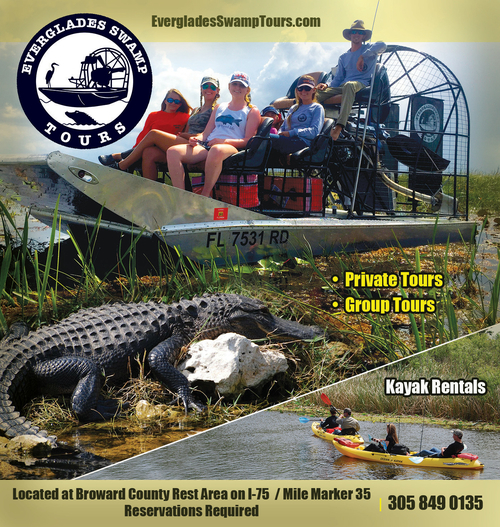 Will you be participating in outdoor activities in the Everglades? Maybe some clubbing at South Beach's finest clubs? Since South Florida weather isn't too extreme, you won't need to pack a bunch of huge, bulky winter clothes. What should you bring then? To tackle the beach and outdoors, a hat, sunglasses, short-sleeved tee shirts, tank tops, shorts, a swimsuit (or multiple ones), sneakers or walking shoes, and sandals are a good start. The ladies may wish to bring sundresses, skirts, and Capri pants too. The more comfortable and lightweight your clothes, the better. You may want to bring a rain jacket/poncho and umbrella if you're coming during the summer or rainy season. For nights out at restaurants, bars, or clubs, button-up shirts - either long-sleeve or short-sleeve can work. Some nice pants or jeans should come along for the ride as well, plus dress shoes to match your outfits. Some women may bring long dresses and heels for particularly fancy outings. Dress codes for South Florida outings vary from casual to upscale. It all depends on where you go. The tropical climate does put people in a more relaxed mood, so you can get away with more casual outfits than in a more formal location like New York City, for example. Again, check with the places on your itinerary beforehand so you pack what you need. And if you forgot to pack something, don't worry: SoFlo is packed with shopping malls where you can pick up clothes and everything else under the sun. Winter visits might call for a jacket or lightweight sweater. Keep in mind that almost every place from West Palm Beach down to Fort Lauderdale, Miami, and The Keys has air conditioning. Even though it's scorching hot outside you could get chilly inside. Beyond clothes, a trip to South Fl. also calls for a few other things that should claim a spot in your luggage. You'll need sunscreen for the hot sun. Without it, you will burn up in a hurry. Aloe is an excellent choice just in case you do get sunburn. Here are more items that you'll probably end up using: Beach bag Beach umbrella Bug spray Anti-frizz hairspray for the humidity Towels Cooler for drinks and snacks Portable music speakers Reading material Beach/sand toys for children Mesh bag for wet swimsuits Water mister or paper fan Again, you can buy all of this once you set foot in South Fla. since malls and tourist/souvenir shops abound. Checking for beach information before heading out is super-important. Check the tide advisories as they can affect your enjoyment of the beach. High tide is better for water activities, like fishing, boating, or kayaking. Low tide is better for kid-friendly activities like searching in tide pools, walking, wading, collecting shells, or building sand castles. Red tide, on the other hand, is a problem that won't make your beach trip too much fun. Also, watch out for jellyfish and other issues, and always make sure a lifeguard is present for safety. South Florida is a beautiful destination to live and visit. For this reason, it attracts many people! Make sure you always plan ahead whether you're visiting a state park, a tourist attraction, or even a well-known restaurant. Some places may require reservations, and the busier the season, the harder they'll be to reserve. If you're ever in doubt, look up the phone number online and call. It's always better to be safe than sorry. Now that you know what to bring and how to plan your trip to SoFlo, browse our site to see specific hotspots where you should go. Palm Beach, Broward, and Dade counties are teeming with attractions. The only issue is having enough time to see them all!